Whoa, okay. All of the sudden it is Summer here in Los Angeles and the client's are craving cold dishes again. I am personally thrilled about this because Garde Manger, or the cold station, in the restaurant is one of my favorite places to be. I think it takes a lot of finesse and skill to make something fantastic without fire, or heat in the kitchen.. and this salad will prove why. 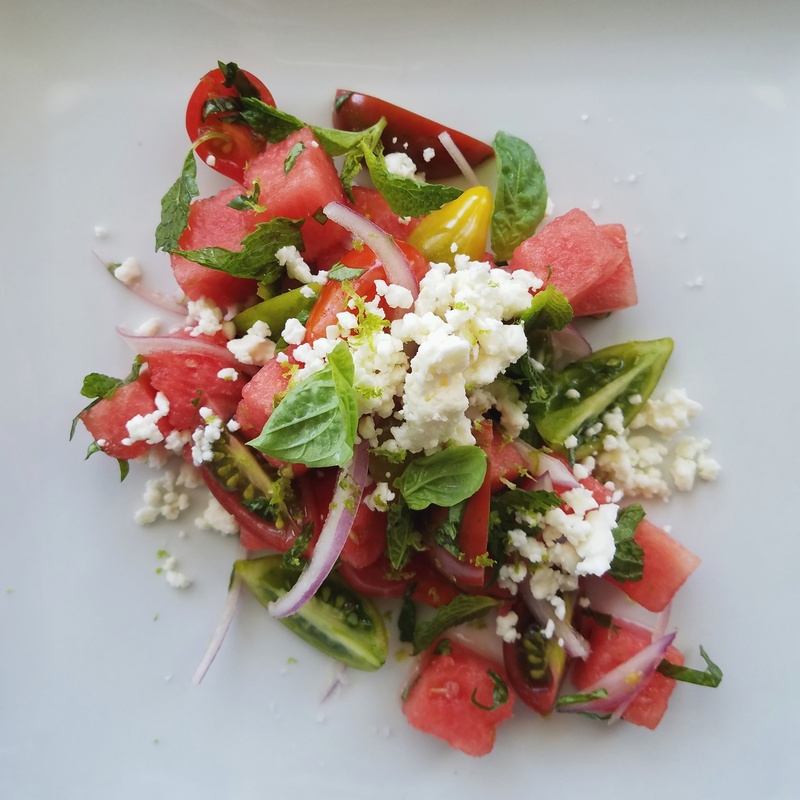 This Salad is a twist on a classic watermelon, feta and mint salad, only I upped the game a little bit by adding some fresh lime juice, zest, shaved red onion and heirloom tomatoes. It gives the salad a different texture contrast, and the acid from the lime pops! It's referenced to as a mojito salad as a classic Mojito contains lime, mint and sugar, which are all represented here. You'll want to eat a whole bowl of this and pass on the BBQ. I'm super serious. Place all ingredients except for salt and feta cheese into a mixing bowl. Toss gently with a spatula until incorporated, season with salt. Plate cantents of bowl into serving bowl or plate. Top with feta cheese crumbles. Garnish with additional lime zest, basil elaves, or mint leaves. 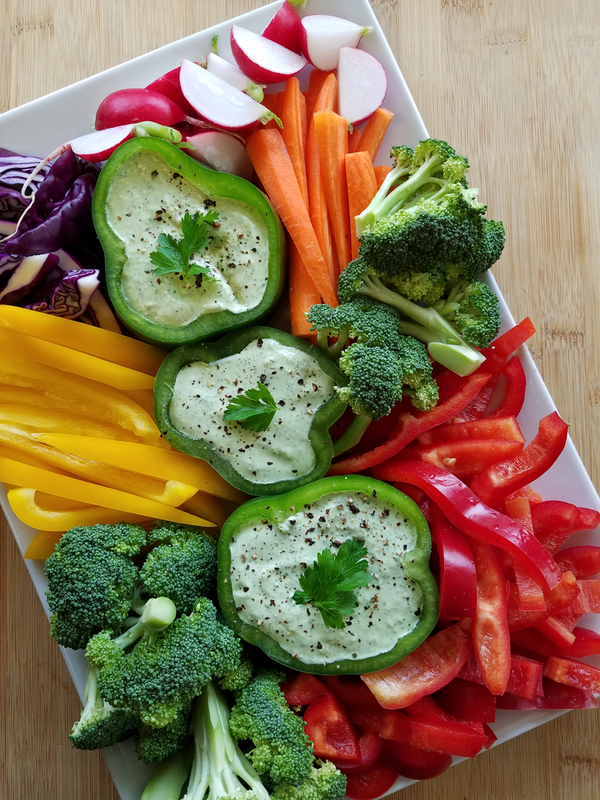 This beautiful green dip is perfect with a fresh crudite platter for any Spring party or gathering. The most time consuming part of this is chopping up some fresh herbs, which means this dip can be made in 10 minutes or less. Place all ingredients into a food processor. Pulse on low speed, then increase to high until smooth. If a smoother consistency is desired, add 2 tablespoons water. Season with salt and pepper to taste. It's one of those nights where you look in the fridge and you have no protein what-so-ever.. and you're definitely not heading to the grocery store.. So you look in the cupboard and what do you see? Garbanzo beans! The savior of all things. Hahaha let's turn this can of bans into something amazing. Like my Turmeric Herb Falafel! Traditionally falafel is made with fresh or dried chickpeas, since I'm not going back to the store, I'm using canned. It's just a few ingredients into a food processor and you'r golden. As golden as the crispy edges of these falafel. Place all ingredients except for olive oil into a food processor. Use the pulse button to blend garbanzo and herb mixture until a consistency of chunky peanut butter, or smoother if you prefer. If the mixture is too wet, add a bit more breadcrumb. Allow to sit for 10 minutes. Roll garbanzo and herb mixture into small one inch balls, then flatten a bit with your palm so it create a thick disk. Do this to all falafel and then they're ready to fry. For the yogurt, mix all ingredients togetehr in a small bowl. 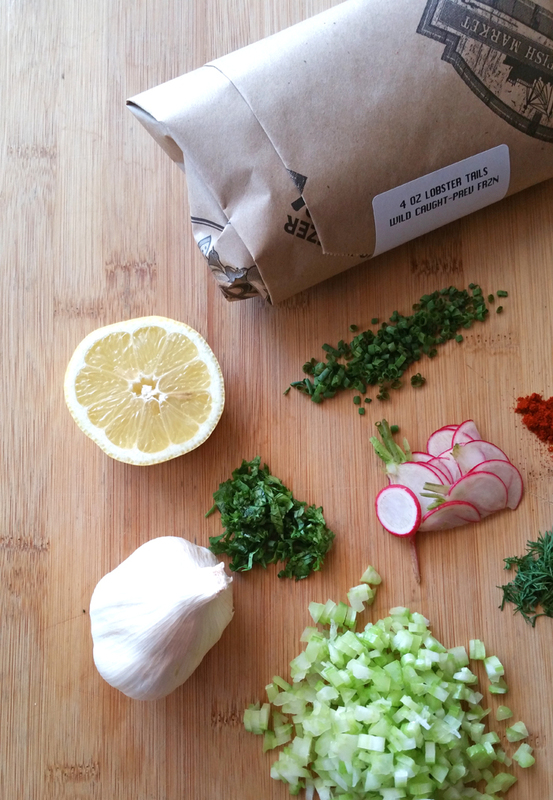 Chill and allow flvors to incorporate while you cook your falafel. In a medium sauce pan, pour a thick layer of olive oil, about 1/4-1/2 inch thick. Heat pan over medium-high heat. Once pan is hot, gently and carefully drop in falafel flat side down. Allow to crisp up for 1-2 minutes until golden brown. flip falafel and repeat on other side, if needed, add a bit more olive oil to the pan. This is called a "shallow-fry." 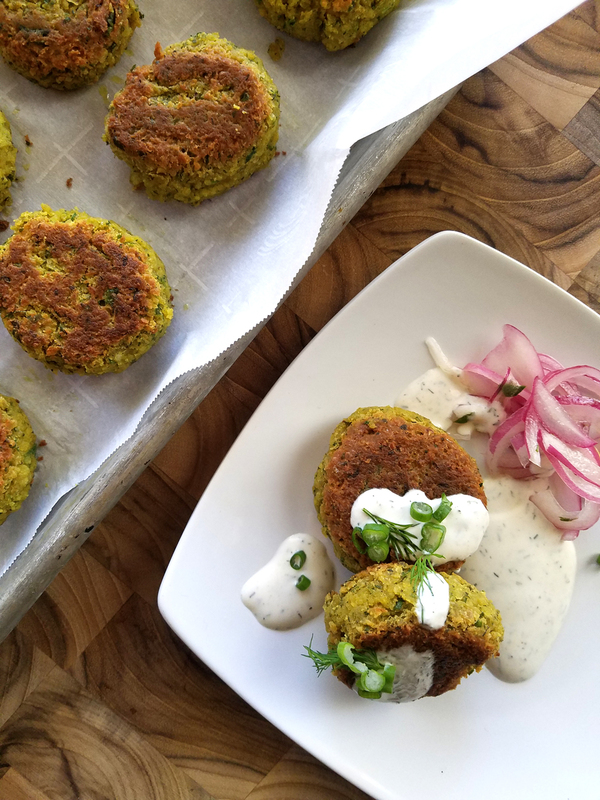 Keep falafel warm in a 275 degree oven or enjoy immediately inside a pita pocket or as is, served with a bit of tahini-dill-yogurt! I also love my falafel with hot sauce made from fresh peppers, and some pickled onions. YUM! Los Angeles had an early rainy season this year, and my mind only goes to one thing.. I needed to make some dumplings. 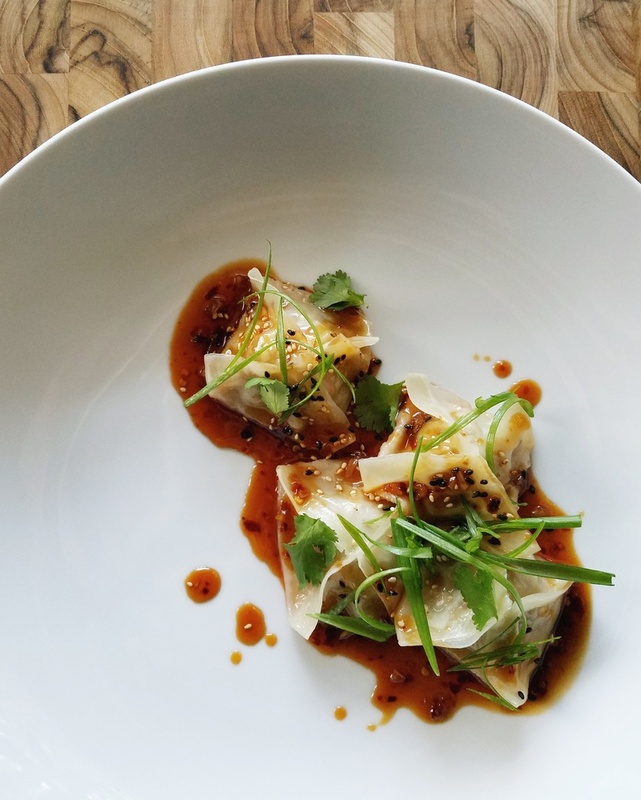 One of my favorite versions are these Pork and Vegetable filled Wontons with a Sichuan-Style sweet and spicy sauce. Normally wontons are used for frying as they are a bit thicker than gyoza wrappers which are typically intended for steaming. So when I prepare these I like to do a quick pan fry and then steam them until the filling is fully cooked. They're so tender, comforting and delicious.. you wont be able to stop. Heat sesame oil in a medium sauce pot over high heat. Add cabbage, onion, garlic, ginger, mushrooms, scallion and cilantro and sauté over medium heat until onions are translucent and vegetables are thoroughly cooked. Add in brown sugar, sriracha, soy sauce and cook for an additional 5 minutes. Remove from heat and allow vegetables to cool. Add cooled vegetable mixture to ground pork, and mix in corn starch until incorporated. Now it's time to fill your wontons. Place wonton wrappers flat down on a clean surface. Fill wrapper with 1/2 tablespoon of pork and vegetable mixture. With some warm water, "paint" the edges of the wonton wrapper with your finger. Bring opposite ends of the wonton together and seal, while bringing up the other opposite two edges to make a pyramid. Press the edges together to seal. Add 1 tablespoon sesame oil to large saucepan and heat over high heat. Once pan is hot, reduce heat to medium and carefully place wontons into pan. Allow to cook for 1 minute, and then add water or broth. Cover with lid and allow to steam on low heat for 5-8 minutes until dumplings reach internal temperature of 160 degrees. Keep covered until ready to serve. Add all ingredients into small sauce pan and bring to a simmer over medium heat. Once sauce thickens and sugar has dissolved, remove from heat. Serve sauce over warm dumplings and garnish with sesame seeds and scallion strings. When Fall and Winter roll around, I love to stock up on the tons of hard squash that flood the market. It lasts a long time, and it's such a cinch to prepare. 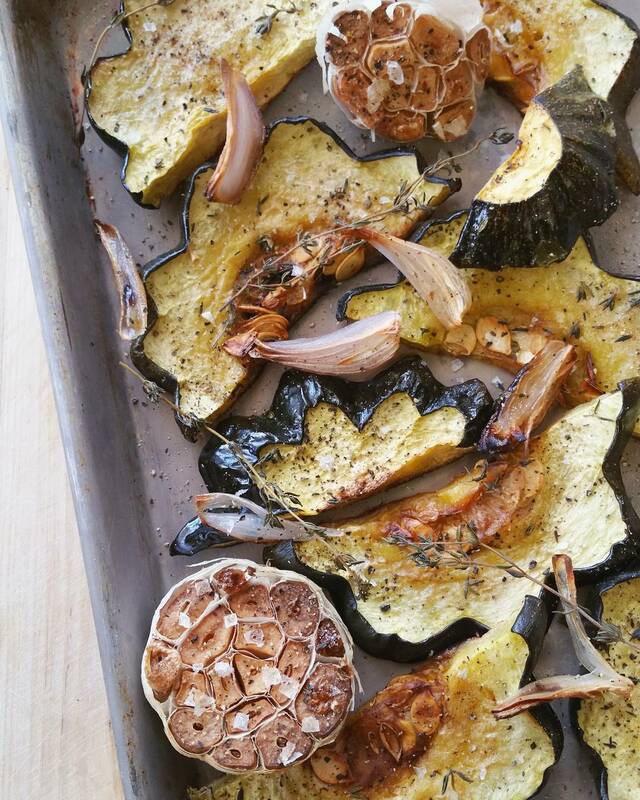 Here, I'll show you how to roast any hard squash to enjoy on it's own, or for other recipes. Line a sheet tray with parchment paper and drizzle with 1 tablespoon of olive oil. Lay squash flat and side to side, sprinkle with salt, pepper, chopped garlic, thyme and sage. Add garlic halves face down onto tray with whole thyme sprigs. Finish with a final drizzle of 1 tablespoon olive oil. Roast for 30-40 minutes until skin and flesh is tender. Remove from oven, allow to cool and enjoy. My other favorite season of the year is Fall. 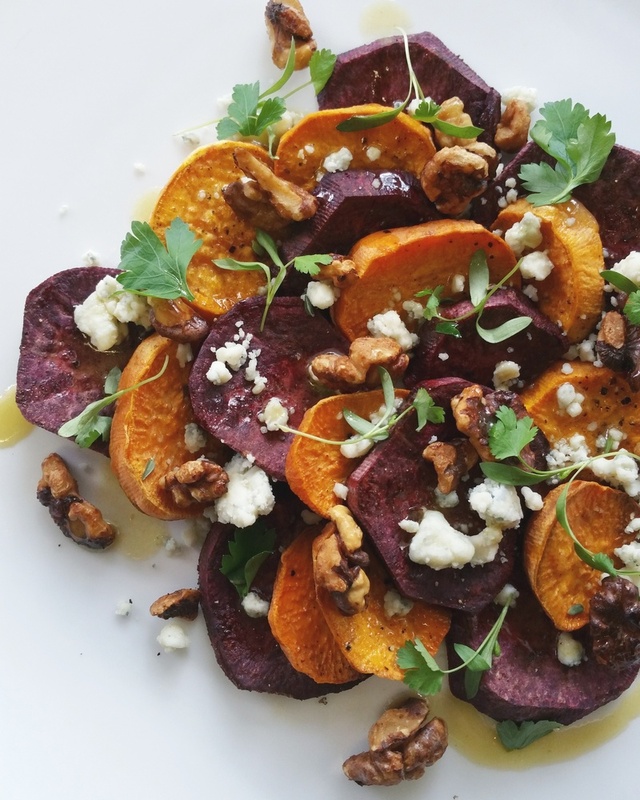 There something so special about Fall flavors.. colors.. and this Roasted Yam, Bleu Cheese and Candied Walnuts dish. This would be perfect as a side dish at your Thanksgiving feast, or for a quick lunch or dinner that's full of fiber and vitamin C.
Prepheat oven to 375 degrees. In a small sauce pan melt 2 tbsp brown sugar with 1 tbsp water until dissolved. Coat walnuts and place walnuts onto a parchment lined sheet tray. Place sheet tray onto middle rack of oven and bake for 10 minutes. Turn over, and bake for another 3 minutes. Remove from oven when cool. On a separate large sheet tray, drizzle 1 tbsp olive oil over another parchment lined sheet tray. Then place yams flat down on sheet tray until filled side to side. Do not stack on top of one another. Season with fresh thyme, salt and peper. Bake for 30 minutes until tender. Remove from oven and allow to cool for 5 minutes. "Scallop" potatoes onto a place and finish with bleu cheese. Allow to melt slightly. In a small mixing bowl, whisk together champagne vinegar, honey, dijon, olive oil and salt and pepper to taste. Drizzle vinaigrette mixture over yams. Garnish plate with candied walnuts and fresh herbs of your choice. Serve warm. 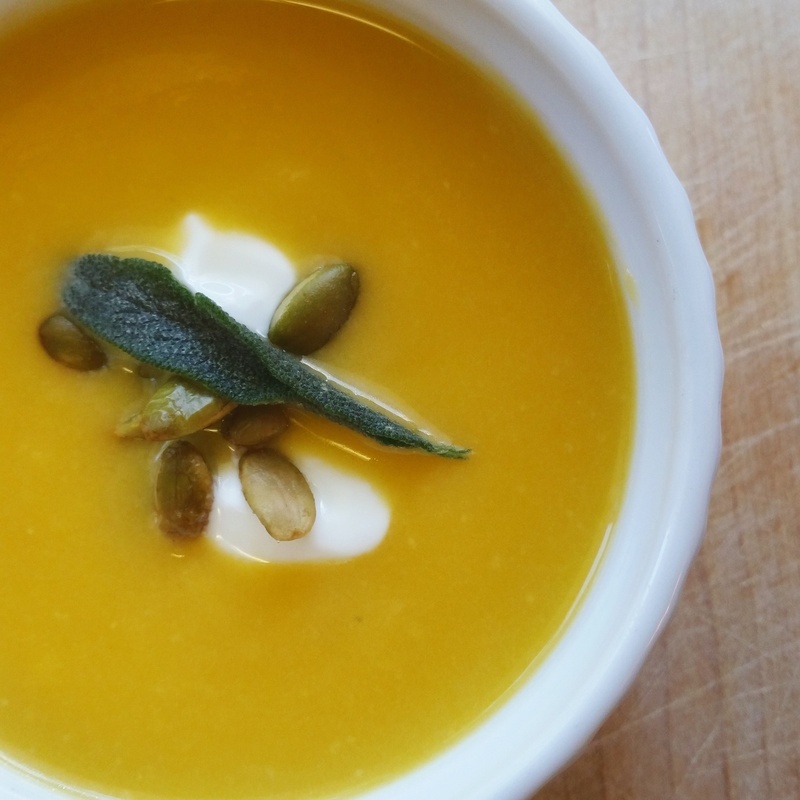 Just in time for Halloween, this pumpkin bisque is comfort in a bowl. Made with the same pumpkins you would prepare a pumpkin pie with, this soup is luscious, sweet, savory and perfect for any ghoulish gathering. In a medium stock pot, place pumpkin, onion, garlic, sage and bay leaf. Cover ingreients with vegetable stock and bring to high heat over your stove top. Once Stock is boiling, reduce heat to low simmer. Cover pot with lid and cook for 30 minutes. Remove lid from pot and stir ingredients. Ingredients will be ready to blend when onions are translucnet and pumpkin is soft and falling apart. Remove the two bay leaves from the soup. Blend ingredients in pot together with either an immersion blender or in a counter-top blender. Please use caution and do blemd soup in batches if you use a countertop blender as it will be very hot. Once your pumpkin-broth mixture is blended to a smooth consistency, add it to a clean medium-sized stock pot and heat over low. slowly add the heavy cream. Stir until all the heavy cream is incorporated in the soup completely. Bring heat up to medium, and allow soup to simmer. Stir regularly. Season the soup with salt until desired seasoning is achieved. The best way to season is in levels, add a bit, taste, add a bit more, taste again. Add a dash of white pepper and stir. Serve soup hot with toasted pepitas, fried sage leaves and creme fraiche. 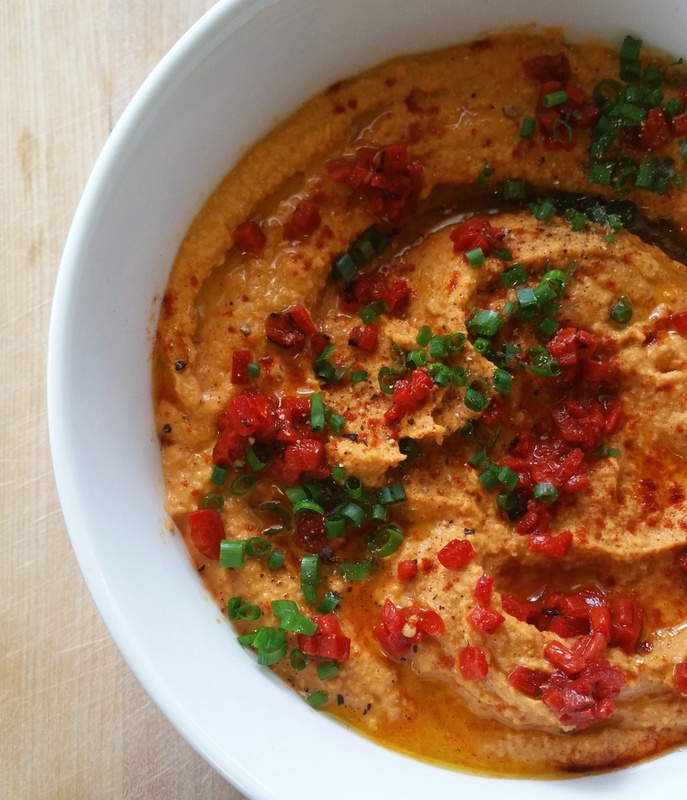 This Roasted Red Pepper Hummus is so easy, inexpensive and delicious, you'll never buy the store bought stuff again! Place all ingredients (except garnish) into food processer and pulse until desired consistency is reached. Garnish with drizzle of olive oil, smoked paprika, roasted peppers and chive. Garnish as you see fit. Sometimes, you just need something that satisfies every taste. Spicy, crunchy, salty, sweet and sour.. These Pan Fried Chicken Gyoza with Red Thai Curry Sauce take a little time to make but are so worth it in the end. In a small sauce pot over medium heart, melt 3 tablespoons butter. Add in onion, ginger, garlic and lemongrass. Saute until onions are translucent. Add in Red curry paste and stir over medium heat for one minute until fragrant. Add coconut milk, honey, turmeric, chicken broth and fish sauce to pot and heat over high heat until boiling. Reduce heat to low and simmer for 15-20 minutes. Remove from heat and blend with immersion blender, or in food processor. Season with salt, lime and white pepper. If you'd like it even spicier, add in a generous pinch of crushed red pepper. Hold sauce over low heat until ready to serve gyoza. In a medium mixing bowl add all ingredients except gyoza wrappers, warm water and vegetable oil. Gently mix with a spoon until all ingredients are combined. In a medium saute pan, heat a 1/2 inch layer of vegetable oil over medium heat until it reaches a temperature of 350 degrees. Then gently drop in a few gyoza at a time to fry. They usually require a turn over or two. The gyoza are done when they reach an internal temperature of 165+ degrees and are golden brown on the outside. 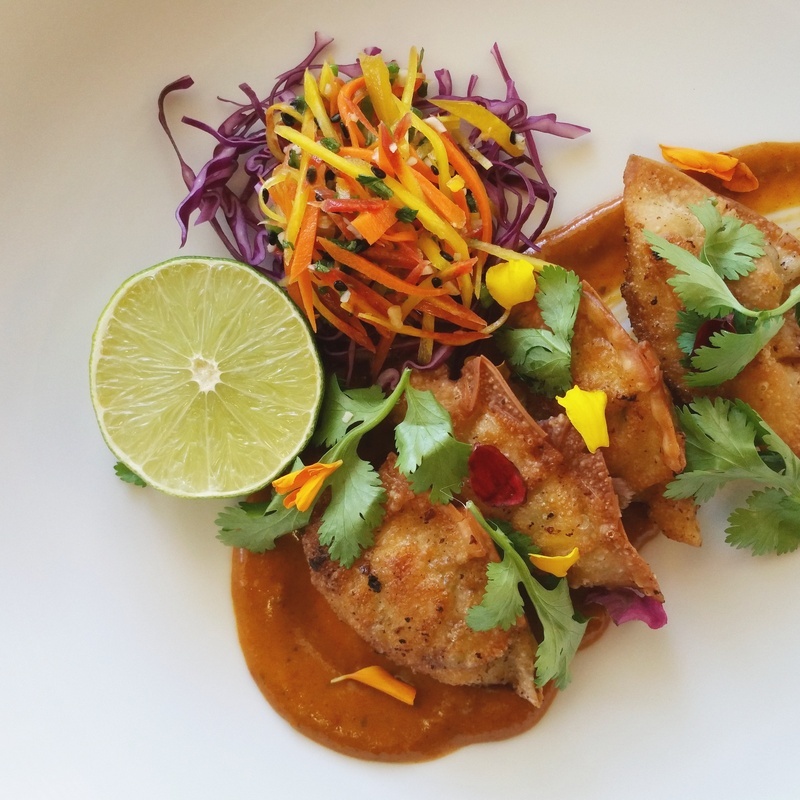 Serve gyoza with warm curry sauce, fresh cilantro, scallion and lime. Lobster tails were on sale this week.. I don't ever need an excuse to buy lobster but if I did, this was it. "What to make, what to make.." I wondered to myself. It's still 85 degrees here in Los Angeles in the middle of October, I'm starting to think it will be Summer forever here. Something chilled would really hit the spot.. "Ah ha!" Mini lobster rolls. These beauties were born..
Pre-heat oven to 400 degrees. Mix togetehr softened butter and garlic. Spread a thin layer of butter on each side of your bread slices. Place bread slices onto a baking sheet. Place baking sheet on center rack and allow to bake for 7-9 minutes until edges are golden brown. Transfer toasts to plate to cool. Combine mayonnaise, celery, parsley, dill, lemon juice, Dijon mustard, lemon zest, and dash of paprika in large bowl; stir to blend. Mix in lobster and gently fold with spatula. Season with salt and pepper to taste. 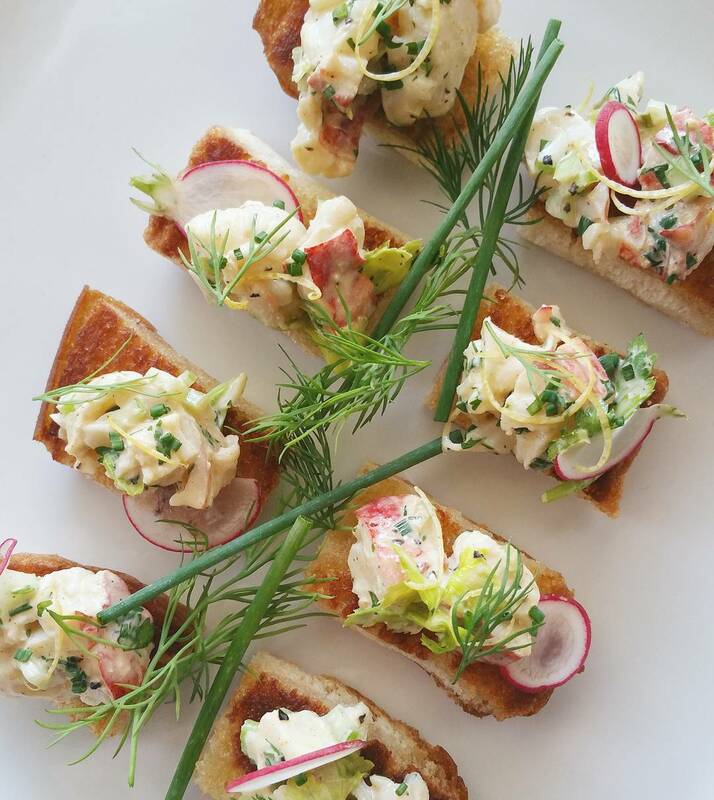 Mound lobster salad onto each toast and serve. Garnish with your favorite fresh herb, lemon or spice from the ingredient list. The best part about Summer coming to an end is the abundance of heirloom tomatoes in the markets. 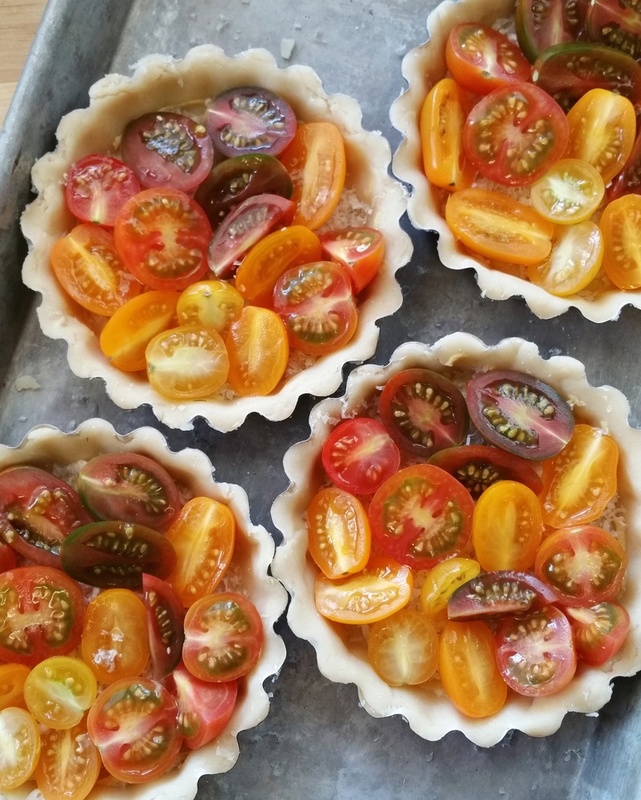 Days ago, I was craving a tart with the sweetness of these beautiful tomatoes and had to make one (or four). This recipe is quite simple, make a crust from scratch, chill it, roll it, fill it and bake it. Finish this off with some balsamic.. or a fried egg and some mixed greens and you've got a sophisticated brunch. Tell your friends it tooks hours to make.. when it only took one. For the dough: Combine the flour, butter and some salt and pepper using a pastry blender or 2 knives until the mixture resembles coarse meal. Mix in 2 tablespoons of the oil and the water just until the bottom of the mixture begins to cling together. If necessary, add an additional tablespoon of oil. Gather the dough into a ball and flatten into a disk. Wrap the disk in plastic wrap and chill for 30 minutes. For the tart: Preheat the oven to 375 degrees F. Roll the chilled dough into a 14-inch circle and place into a 12-inch tart pan with a removable bottom. Chill in the refrigerator for 15 minutes. Spread the mustard over the bottom of the tart shell. Sprinkle the Gruyere evenly over the mustard and place the tomatoes seed side up over the Gruyere. Bake on the middle shelf of the oven for 30-35 minutes. Mix together the olive oil, basil, parsley, thyme and garlic in a small bowl. Brush two-thirds of the mixture over the finsihed tart. Remove the tart and cool briefly before serving. Serve warm with the remaining herb oil. Top with a fried egg, more gruyere, balsamic reduction or enjoy as is. Bacon. Yes, bacon. Can it get any better? Well apparently, it can. 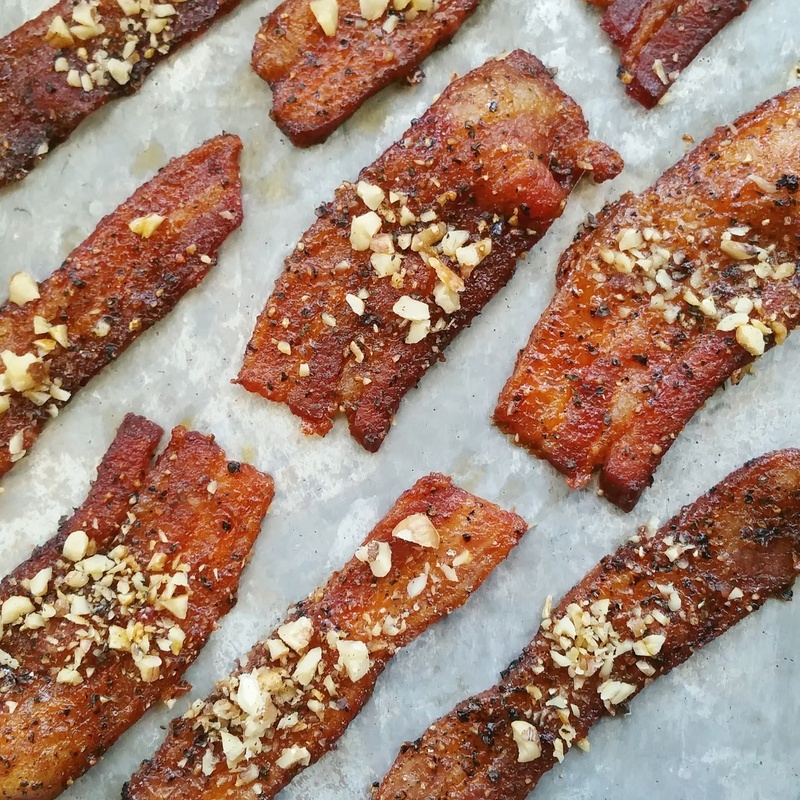 This recipe for my Black Pepper Candied Walnut Bacon will have you returning for slice after slice. Perfect as a snack, or on a sandwich, salad or with brunch these tasty morsels are not only delcicious, but simple to make. If you'd like a spicy version, add a sprinkle of cayenne pepper or a tablespoon of Sriracha when mixing in ingredients. Pre-heat oven to 325 degrees. In a medium mixing bowl add in bacon, bown sugar, paprika and pepper. On a parchment lined baking sheet or silpat, uniformly place bacon 1/2 inch apart from each other. Place on middle rack of oven and bake for 20 minutes. Check on your bacon at the 20 minute mark to see if you need to remove any fat from the pan. Continue to bake for an additional 5-10 minutes until desired thickness is reached, the longer the bacon cooks the crispier and thinner it will be. Remove bacon from oven and allow to cool on cooling rack. Sprinkle with chopped walnuts while fresh from the oven. Bacon will stiffen up a bit after a few minutes. Enjoy warm, room temperature or chilled. So I made this simple, savory Mushroom and Goat Cheese Puff Pastry Tart at an evet a couple of weeks ago and the guests enjoyed it so much I had to make some for myself! I was at the market and king oyster mushrooms were on sale, but really, any mushroom will do in this recipe. I choose to use white button or crimini mushrooms as the base and then add in some oyster, king oyster, enochi, maitake, shiitake, chantrelle etc. to fit whatever flavor profile you are seeking. It's all finished off with a drizzle of balsamic, butter, thyme, chive and crumbled goat cheese. So GOOD you won't be able to help yourself from having one more bite. 1/2 Pound Any Other Mushroom, I used Oyster but you could use Crimini, Enochi, Maitake, Shiitake, Chantrelle etc. In a medium sauce pan over medium high heat, heat olive oil and add mushrooms, shallot, garlic and thyme. Saute or stir with a wooden spoon for 5 minutes until mushrooms start to sweat and soften. Add balsamic vinegars, sugar and butter, stir and reduce heat to medium low and allow to cook for 5 additional minutes, stirring every minute or so. Reduce heat to low and allow to cook for another 10 minutes. until mushrooms are fully cooked. Remove from heat and move to next step. Preheat your oven to 400 degrees. Remove puff pastry from freezer and place onto greased or parchment lined baking sheets. If you have not cut your puff pastry already, most puff pastry rolls will conveniently open up into 3 perfectly sized sheets, each package should provide you with 6 total. Be sure to give about an inch of space in between each tart. Also, it is important to make sure the puff pastry is always frozen, or it will not rise properly. So if your puff pastry for some reason gets soft or comes to room temperature for being left out too long, just pop it back in the freezer to seize back up. With a pastry brush or clean paint brush, brush the egg yolk (or egg wash) mixture over the top of the puff pastry until coated. You just need a thin layer of egg yolk, this is done to give the tart a nice crispy brown edge as seen above. It really makes all the difference. Once your puff pastry is coated with egg wash, spoon mushrooms down the center of the puff pastry, leaving the edge naked for a crust. Once your mushrooms are placed on the pastry youre ready to bake. Place your baking sheets on the middle rack of the oven and allow to bake for 15-19 minutes until puff pastry has fully risen, and the edges are golden brown. Remove pasty from oven and allow to cool. 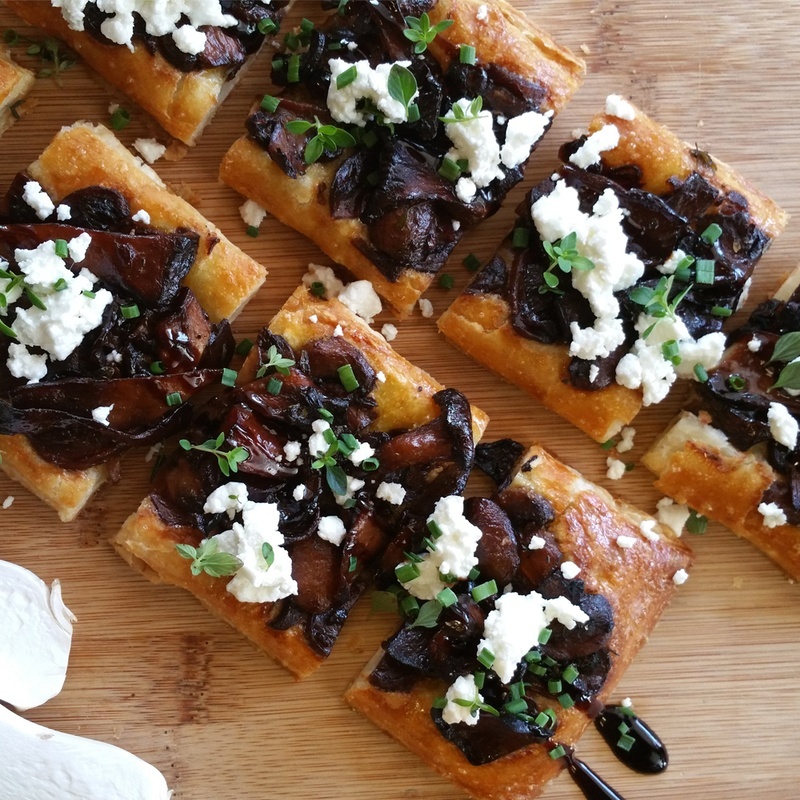 Top each tart with balsamic reduction, goat cheese and herbs to your liking! I thin cut each tart into 4 pieces and serve them up on a cutting board or my guests to enjoy. I hope you love them as much as I do! 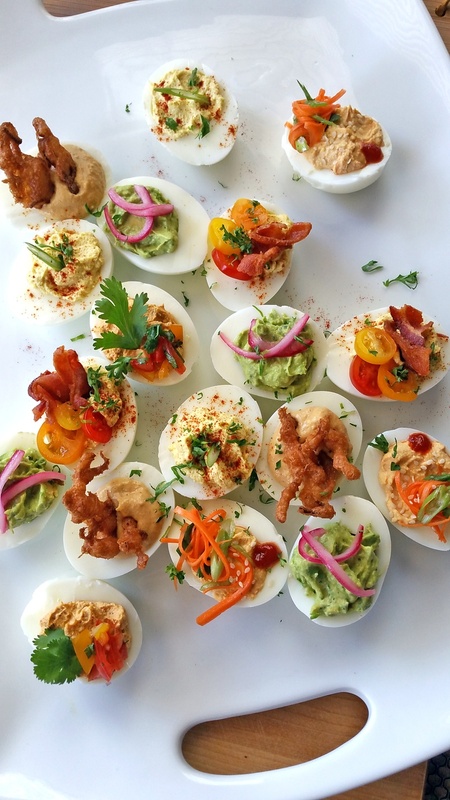 Bored of the old standard deviled egg? Well, these two types will certainly spice things up. One afternoon I had an immense craving for deviled eggs, and that is where this platter was born. Two of my favorites of all were the guacamole and Korean versions. The guacamole sounds just what it sounds like, avocado, cilantro, lime and itsurprisingly does play well with the egg. While the Korean egg is seasoned with a bit of gochujang (and/or Sriracha!) and finsihed off with sesame seeds and lightly pickled carrot and scallion.. would be perfect in a bibimbap! Take hardboiled yolks and blend or finely smash with mayonaisse. Separate mixture into two. Take your preapared deviled egg filling and mix it with 1/2 avocado, cilantro and juice from one lime. Blend or smash with a fork until all ingredients are smooth. Season with salt and pepper to taste. Pipe filling into 6 egg white halves. Garnish with pickled red onion, cilantro or pico de gallo. Take your preapared deviled egg filling and mix it with gochujang and sriracha. Blend or smash with a fork until all ingredients are smooth and integrated. In a small bowl mix carrot, ginger, scallion, salt, sugar, rice wine vinegar until incorporated. Allow to quick pickle while all eggs are moved to the refrigerator to chill. In about 15 minutes, your pickles will be ready and you can top them on top of the Korean deviled eggs, along with another dash of sriracha and sesame seeds. Happy Cinco de Mayo! 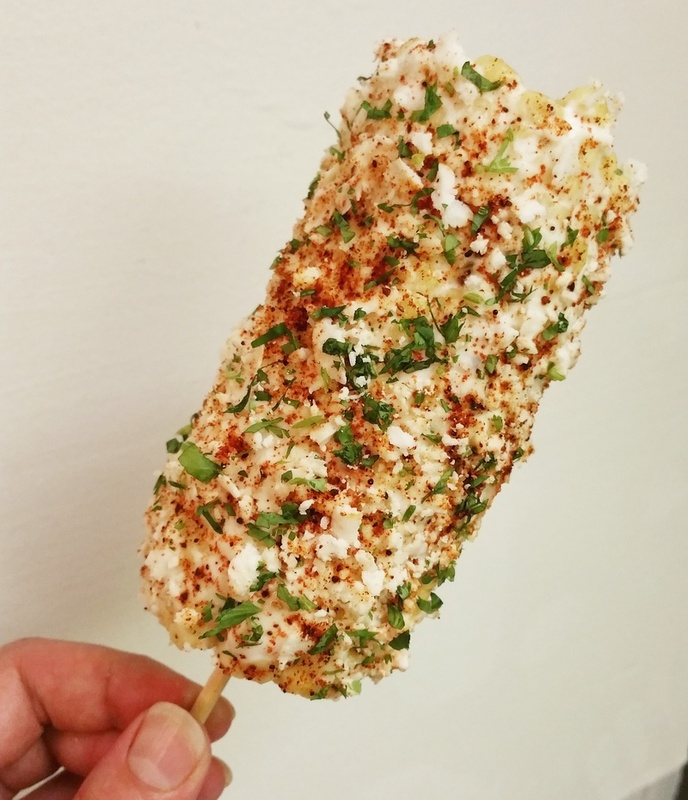 One of my favorite snacks to make in the Summertime when the corn is in season, is elotes, or Mexican street corn. These tasty, savory treats are steamed or grilled corn that is smothered in Lime, Mexican crema, Cotija cheese, chile, and garlic. A simple and decadent side dish that is fun to make and fun to eat. Your kids (and significant other) will be begging you for these..
Skewer each ear of corn with one wooden skewer as pictured above. Fill and large stock pot half way with hot water, place onto stove top and bring to a boil over high heat. Season water with salt as you would pasta. Drop corn ears into stock pot, cover and allow to steam for 5 minutes until tender and cooked through. Remove corn from pot. While your corn is cooling down, mix garlic, and chile powders in small dish until mixed evenly. Using the halved lime, apply lime juice over the outside of the corn. Then with a pastry brush, or bbq mopping brush, apply Mexican crema to the outside of the corn. Sprinkle grated cotija cheese over corn until coated evenly. Sprinkle garlic chile powder mixture over corn until evenly seasoned. Sprinkle lastly with cilantro. Continue until all ears are covered, serve.